Small business owners often do not have the resources to buy a space of their own right at the beginning of the business. To such people, commercial leases are a boon. Such a lease lets a person rent a property pretty much the same way how houses are taken for rent. There will be a monthly rent or a lump sum amount, a maintenance charge and a few other rules that will be laid down for both the landlord and the businessman. How To Create A Commercial Lease Document? Commercial leases (short term or long term rental agreements) are used to lay down the terms and conditions before a space is rented out for commercial purposes. It could be for shops, offices, godowns or manufacturing units or basically any entity that produces income. One needs to understand that commercial leases are very different from rental agreements on most aspects. Many agreement formats are available online for free, but such documents may not cover protect your interests and may miss out on some key clauses. We recommend that you use a draft prepared by professionals. Any person who wants to set up a business in a rental property can use a commercial lease. He needs to be over 18 years of age to have a commercial lease in his name. Likewise, any landlord who wants to to let his place to businesses or income producing entities. It does not always have to be an individual, companies can also get commercial leases from landlords or even other companies. Following are some of the most vital clauses in any kind of commercial lease. The omission or careless drafting of these clauses may leave you vulnerable should a legal dispute arise. Commercial leases, while in function are quite similar to rental deeds, they have some favorable differences. Like for instance, commercial leases subject to most consumer protection laws and they are long term and binding. They are also negotiable and flexible as compared to rental deeds. No standard forms are followed in the drafting of commercial leases. As the nature of business changes, the format and clauses may also change. Like every legal document, names and address of parties involved must be clearly written. Term or duration of contract along with appropriate clauses must be clearly spelled out in the contract. To make a commercial lease legally valid, it needs to be printed on stamp paper of appropriate value. If the rent and deposit amounts are large, it is always recommended that you register the agreement at the sub registrar office. For rentals longer than 11 months, registration is mandatory. What Are The Basic Elements Of A Commercial Lease? The points to be included in a Commercial Lease Agreement could vary depending on the type of business. 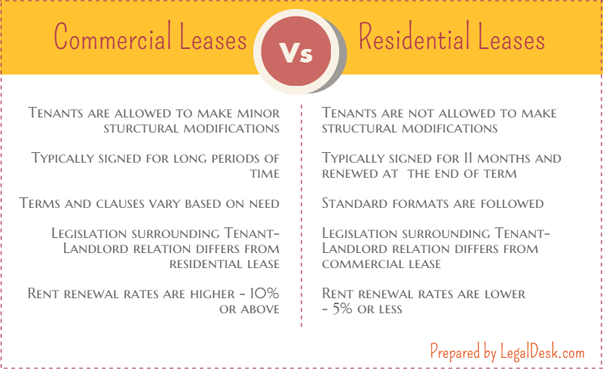 However, some of the following factors need to be covered in almost all commercial leases. Here are some things that the owner should keep in mind while leasing out his property. LegalDesk has host of expert verified, comprehensive, pre-drafted commercial leases up for grabs! This means that you don’t have to worry whether your commercial lease is solid enough. All you have to do is fill in your details and review the document. We will print it on stamp paper of appropriate value and mail it to your doorstep! 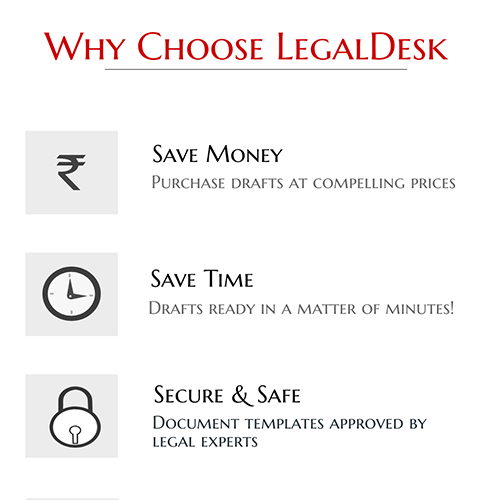 Create a Commercial Lease with LegalDesk now!